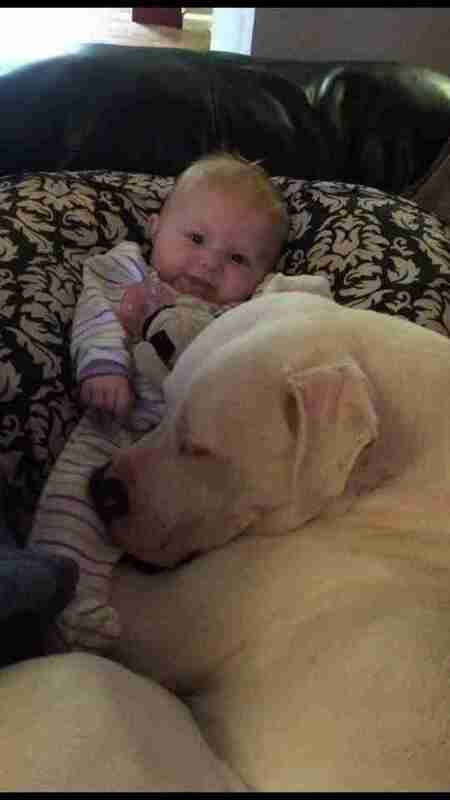 Even when Adalynn Leary was just a baby, she found comfort and joy in spending time with her best pal — a 100-pound pit bull named Fury. But recently, the young toddler has been relying on the dog's unwavering sweetness more than ever. And she's offering him the same in return. Late last November, a powerful earthquake struck near Adalynn and Fury's family home in Alaska. As if that alone weren't frightening enough, the aftershocks that followed have kept everyone on edge. It's been especially hard on Adalynn. "[W]e’ve had over 5,000 aftershocks," Kyle Leary, her father, wrote online. "Since then, Ady has been having severe anxiety and trouble sleeping." And it's hard to blame her; the experience was certainly a scary one. Fortunately, young Adalynn has found an adorable way to cope, especially at night when worried thoughts could easily sneak into mind. She looks to her pup. "The only way she’ll sleep is if Fury is in there with her to protect and ease her anxiety," Leary wrote. "If you raise them with love, they only show love."